The Image hotspots content type allows you to place to place an overlay of hotspots on images and graphics. The user presses the hotspots to reveal an associated text. Image hotspots can be useful for creating infographics fast and simple. Use any image and enrich it with points of interest and in-depth information about the details depicted. The user is activated by interacting with the image. Navigate to the menu that enables you to create new content. In Drupal, you select Interactive content. In WordPress you press Add new under H5P Content in the admin menu. In WordPress you select H5P Content and Add new from the admin menu. Select the Create option for H5P. If you find Image hotspots in the list of Content types, skip to Step 1. You will now find Image hotspots in the Content type list when creating a new H5P. We'll use an image found on Wikimedia Commons of various berries as the background image for our Image hotspots. Head over to where you usually create new content on your platform. In Drupal you go to Create content and select Interactive content. In WordPress you select H5P Content and Add new from the admin menu. Then select the Create option for H5P and choose Image hotspots from the list of Content types. The image will be scaled (proportionally) to fit the max width of the container in which it is placed. It is possible to view the Image hotspots in fullscreen. Therefore, choose an image with a suitable resolution. We'll use the full resolution image found here. Remember to add any license or copyright information associated with the background image you use. This is the background color for the hotspots. The color is specified in a hexadecimal format. You can use this color picker to find the six digit hex code for the color of your choice. You can add as many hotspots as you like, as long as there is enough space to fit them all into your image. The Header is the title of the hotspot and it will be revealed when the user presses the hotspot button. Click anywhere on the image where you want to set a hotspot. The green circle will appear to indicate the position of a new hotspot. Hotspot can be repositioned by clicking again on a different place on the image. Popup is used to describe the selected hotspot. Hotspot can be described by using a text, a video or an image. You can add as much text as you like. Scrollbars will appear if the amount of text cannot be viewed within the image. Strawberries are the only fruit with their seeds on the outside, and are said to be immunity-boosting. Press the Add hotspot button to add the three other hotspots in a similar manner as above. Save the node/article to view your finished Image hotspots. Can I arrange radio buttons on an image? Can I arrange checkboxes on an image and collect the list of selected checkboxes as input. Is it possible to label the hotspots? I want to put a number or a text instead of the circled "+" sign in each of the hotspots, a different text or number for each of the hotspots. Is it possible? I don't find how to do it in the UI? Can be done programmaticaly? Maybe with some hook or alteration to the code? It is not possible to do this at the moment, but you could modify the hotspot code and suggest a pull request. It might be possible to do this without changing the official code as well, but a lot harder. You would have to use the drupal hooks or Wordpress actions to change the semantics to make the field appear in the editor, and then add a js that adds your labels to the page. How I can add Vimeo or YouTube? I was trying to paste embeded code into text area and didn't work. There is another way? I see in your tutorial that you refer to Drupal and to Wordpress. Are those the only platforms that allow this interactivity? I am trying to use them in a Weebly website I am creating. Will that work? You may create the content in Drupal or WordPress and perhaps embed them in Weebly if Weebly supports it. Support for more platforms are coming. Can I make the hotspot invisible? I want to make the hotspots invisible, (no graphic), is that possible? Also, how can I 'fine tune' the locations of the hotspots? Hi, it's not possibel right now to make the hotspot invisible or to fine tune their location. Would you mind explaning how you would like to use Image Hotspots? Well, I just wanted to have hostpots over an image, and since the image already has indicators on it, I wanted to just make a hotspot over the areas of the image without having any graphic obstructing the already noted spots to hover over. Maybe I could just make a transparent indicator graphic, like an invisible GIF, for H5P to use? Yes, I think this is a good idea. It will need some development work to be done with the existing code. Perhaps you could make a post under the forum topic 'Feature Requests' with a detailed description of how you would like it to work? Maybe a developer from the community will see it and pick it up. Unfortunately, it's not possible to add an Image Hotspot to a Course Presentation. The closest thing I can suggest is placing them both in a Column. Cannot tell you how useful this Image Hotspots tool is! However, when you go fullscreen, there is an issue with line spacing and the text squashes together so that it is illegible. This happens on Chrome, Firefox and IE. That's great. Thanks so much for your super speedy reply! I am a bit of a Newbie and am learning the power of Wordpress a little more every day. Just came across h5p and it looks really cool. Does anyone have any tips about how best to use the "Image Hotspot" tool? Such as recommended image sizes and proportions.. Is there a list of implemented live examples I can look at to get inspired? The Image HotSpot is really easy to use, but there are very few parameters or guidelines how to use it, and the results are great. My biggest issue is the required image sizes. I have tried modifying images but still I get instances where images are trunkated by the background image or text will not format correctly. It would be great to have some more details. Thank you. I will go to the forum and dig around! I do not have a developer and have to rely on the plug in "as is".. I would not know how to start messing with it. Do you know if anyone is working on it? Will there be any updated and fixes? If not, I have no choice but to pay for a commercial solution which are really expensive and will need yearly payments to update. We are only a small non-profit charity and I am trying to keep costs down as they essentially come out of my own limited pocket. Any thoughts how I should move forward would be great. I am prepare to contribute. there is a chance that a developer from the community will pick it up. Maybe even adding that you are willing to contribute to the development would make it more attractive. Commercial solutions are often prohibitively expensive (especially for non-profits) and that's the reason why H5P was created in the first place. I encourage you to find a developer who is willing and able to do this and once the feature is added you'll (and the rest of the world) will have access to it for free, forever. I do not know anyone who could pick this up and work on it. Who was the original programmer? I suspect they would be the best as they know the way it was written. I only want to get the image scalling to work properly at first and some way to adjust parameters (font size etc.) at this stage. Of course, it would be very cool to add more features, but at first the current revision needs to be made more user friendly andless prone to errors... How do I contact the contributor? Hi Thomas, feel free to contact the company I work for: Joubel. We are the developers behind H5P and are open to consultation for the adding of features. Firts of all, thank you for spending your time and energy to produce H5P. I am not in a position to pay a lot of money to develop the HotSpot plug-in further, but I would be prepared to contribute. Initially I am just looking to get it to work fully in its current form. You can just let us know which improvements you'll like to see and we can give you a quote. 1. The hover text does not work..
2. The pop-ip images are too large. There should be some way to adjust this..
Is there a way to place a hotspot on a larger size version of the graphic than the thumbnail or am I missing something>? None as of the moment. Please head over to the Feature Request Forum and post your suggestion. Hi there - is there by now a solution how to make Hotspots invisible? I saw that there was a conversation about this earlier but didn't see if something happened about it. I would like to use it in the way, that the users have to search for the right spot in the picture (which is a search picture with many details) to find the right spot - so for that I would need the invisibility. Have you tried using Find Multiple Hotspots, the hotspots in this content is hidden. Is there anyway to add "Image interaction" with multiple image in Interactive video and also show tham as slideshow in the interaction point ? as I know we can have only one file in "image". You are correct you can only add one image but you can use the image content multiple times in a presentation. Is it possible to embed an image hotspot in a html page? 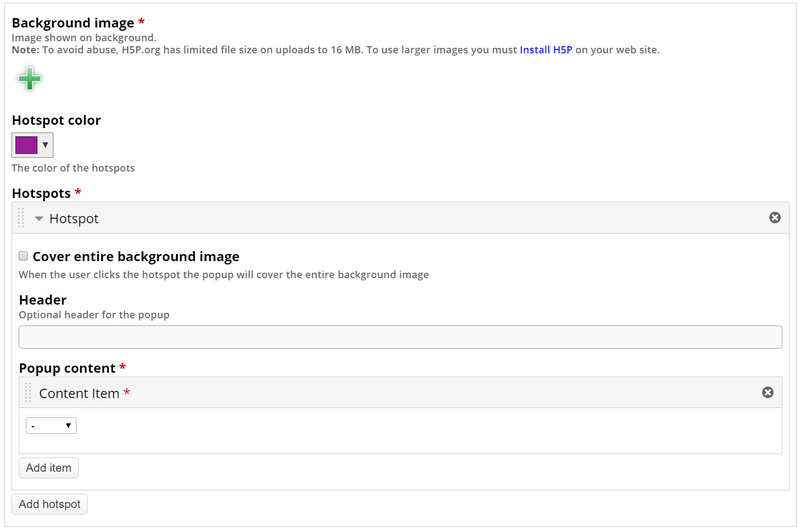 I create the image hotspot using the Moodle plugin. I can´t find where do I can get the embed code so I can insert this resource in a html page. Thank you in advance. When creating/editing the content you have to enable the "embed button" under "Display Settings". This will display the embed button at buttom of the content after saving it. Thank you, but I can´t find any embed button in Display options of Moodle and I don´t have Display settings for H5P as you can see the attached image. Then, I downloaded an example of image hotspot from your site, and upload in Moodle and when I tried to save it, I get an error message for h5p library. For your first question, if you are the administrator please go to site administration->Plugins->H5P settings and make changes to the display options. For the second question, can yo please check if you have any browser console error (Ctrl+shift+J in Chrome) and PHP errors. Thank you, I resolved the issue of the display options, with the last update of H5P. Now, I can create and embed a hot spot image. In each hotspot, I see that I can have text, image or video but I am not able to just put a Youtube video UrL,I only see the option to upload a video file. Hi Myriam,This is quite odd. This is quite odd. Can you please try creating a test content here in H5P.org and add a video using a Youtube URL. Download the content and upload it to Moodle. Once done try creating another content in Moodle. I'm trying to align hotspots on an image. Above it says "Insert 54 for the Horizontal position and 55 for the Vertical position on the Strawberries hotspot." I cannot find a place to insert numerical positions. Everything is done with the cursor in the thumbnail image. This leads to misalignment when I would like several hotspots to have the same position (y-axis). Was the referenced feature erased in the current version? I'm sorry for the confusion. I think you are correct and thank you for pointing that out we'll update the documentation. In the discription is says you can add text, video and an IMAGES. In the video tutorial you can see a drop down with the image option. Why is this version without this option? Has there been an update? The images function doesnt seem to work in wordpress. Is there a way to fix this?